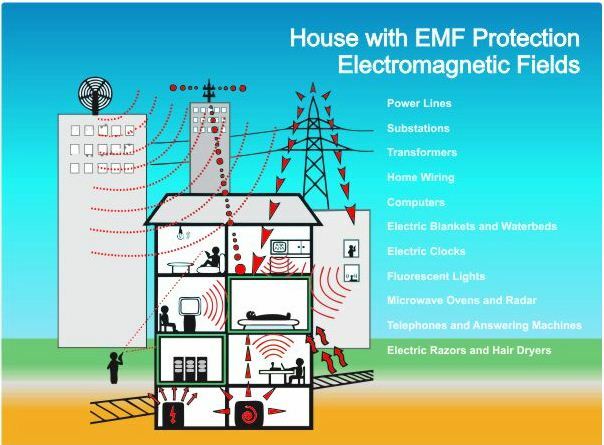 In the photo are sources of EMFs from your surrounding environment (source of photo: http://heyde-haus.com/emf-shielding/). A few years back, I woke up one morning with a serious case of VERTIGO. I was wondering where I got it, because I only had one similar incident when I had vertigo, and this was when I accidentally slept with my head slightly lower than my body and heart during the night. So this was pretty unusual for me. Years later, I read about EMFs (Electromagnetic Frequency Waves) which are low frequency waves emitted by electromagnetic devices and appliances such as cellphones, cellphone towers, microwave ovens, wifi modems, laptops with or without wifi and Bluetooth, even halogen and fluorescent lights. Unsuspectingly by us, these electronic devices are emitting these low-range waves which are reportedly causing brain tumors, mood swings, irritability, heart-related problems, unexplained fatigue, and in my case, vertigo. In those days, I didn’t realize that having the TV cable box for the entire residential block located at a post on the corner of my house was actually affecting the behavior and physical disposition of the occupants of our house. But up to now, even my family is not aware nor believe me that these devices do have an effect on their mood swings, irritability and fatigue. So dear reader, I would like to enlighten you on how to protect yourself or minimize the disastrous effects of EMFs on the body and how the “Powers that Be”, meaning the Reptilian-related power groups on the planet use it as part of their plan to dominate the world. Many people, particularly not only shamans, have their own techniques on protecting oneself from these EMF emissions. I have a few that I’ve been using for some time and find it quite effective but do feel free to share your tips or what works best for you. So when I read up for the very first time about EMF sources, I did some “investigating” around my area about where they could be coming from. This involved reading up on the subject on the internet, which I say, there are a lot you can glean from. That was when I found out about the cable box at the corner lamp post of our property. And then I found out about microwave ovens and wifi, and where the wifi modem is located. I am not saying that you should stop using your cable TV or wifi, or even your cellphone. All I’m saying is that if you are not using these appliances, do turn them off, including your cellphone. Personally, I turn off my cellphone and put it at least a few meters away from my head when I’m going to sleep for the night or sometimes, when I’m taking a nap. But I’m also aware that even if your cellphone is turned off, it still emits a signal which means anyone with satellite tracking capabilities can practically hound you down on the planet. Basically turn off your electrical appliances when they’re not in use and especially when you’re going to bed. When I was told not too long ago to “ground myself”, I couldn’t understand it at first. I thought I was very much a down-to-earth person and didn’t need to “ground” myself for any reason. But later on, I learned that grounding myself is also another way to protect or lessen the impact of EMFs on your body and mind. * Go out and find a big tree in a glen (I usually choose one with big roots so I can sit on or in-between them 😉 ). Put your hand on the bark and gently ask the tree to help you ground yourself. Soon, you will feel a “tingle” on your hand or somewhere near your scalp or any part of your body (I usually feel the tingle on the top of my head or on my nose). This is an indicator that energy is being transferred from the tree to your body. You can also meditate under the tree if you like. * You can also ground yourself by walking on the beach barefoot or walking on soil or fallen leaves barefoot in a forest. I believe one of the best protection against EMFs are the natural world itself. Do you have trees and plants growing around your home or property? Are you living near nature — like a forest, the ocean, a meandering stream, a glade or even a small leafy park? Trees, streams, forests – these nature-based things are vibrating at a higher level than electro-magnetic frequencies. I was taught that they are a natural cover and barrier to these frequencies. Moreover, nature-based creations are natural habitats of nature spirits like dwarves, elves, fairies, woodland nymphs, mermaids or water nymphs (they also frequent mountain streams and lakes), tree spirits, etc.. These entities or spirits are only too willing to help shield you from negative EMFs, if you request them to do so. One time, I was eating at my fav little restaurant in the middle of our little town. Suddenly, I felt a tingling on the left side of my jawbone. The tingling slowly spread to my left temple and was starting to make me dizzy. This is a sign that a Reptilian entity (what we call an “R”) is around or moving towards my vicinity. But at that time, I wasn’t familiar with the early warning signals my body was reacting to in the imminent presence of an R.
It was a really weird and uncomfortable feeling – this tingling that slowly changed to a ringing feeling on my jawbone and temple and slowly started spreading to the back of my head. I thought I was going to be helpless to such an attack – until I remembered the huge, leafy mango tree standing at the corner of another café across the road from the restaurant where I was. This huge mango tree had fairy folk inhabiting it. In fact, it was one of the gateways to their world. There was an Beautiful Lady of the Enchanted Wood there, dwarves and a minotaur-like creature who always said hi when I went past it. I sent an urgent telepathic message to the Beautiful Lady and the woodland elves to help me overcome this attack on my persona. In just a few seconds or minutes, I could feel waves of energy being sent my way from the entities in the mango tree across the road. This blast of energy enabled me to shake off this debilitating feeling and rid myself of the migraine that was descending. So yes, I believe calling on these nature-based spirits to help you is another way of combating EMFs sent your way. *Personally, this is one of my fav ways to protect myself from EMF pollution. I wear these crystals either as a bracelet or necklace. But you have to “program” the crystals to protect you from EMF pollution, and regularly cleanse them afterwards. See this blog post on how to program and cleanse crystals: https://shamanainthemaking.wordpress.com/2015/08/16/a-guide-to-crystals-that-aid-in-psychic-protection-and-psychic-attacks. *Black Tourmaline – good for grounding too! How about you? What other ways do you use to keep yourself safe and unaffected by EMFs? Perhaps you’d like to share your tips and info in the Comments section below? Lightworker and shaman in the making ;). Still looking for the rest of my Tribe of Light on Terra. Come join me make the Earth a beautiful place to live in peace, love, joy & compassion :)! This entry was posted in psychic attacks, psychic protection, Shamanism, Spirituality and tagged electromagnetic frequency waves, EMFSs, grounding, higher dimensional beings, negative energies, negative low frequency waves. Bookmark the permalink.